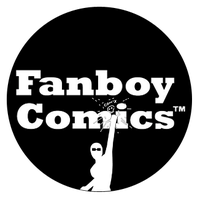 Or buy the physical comics @ these shops. Tobacco-Stained Mountain Goat was the first published novel of Andrez Bergen, author of such works as Who Is Killing the Great Capes of Heropa and the Bullet Gal comic series. The post-apocalyptic, dystopian, sci-fi noir world in which the story takes place has been a continual presence in much of his work since then, with characters, themes, settings, and plot points providing influence throughout his oeuvre. Now, Bergen has taken that first book and adapted it into graphic novel form. Most of the world was cataclysmically destroyed by a virus 15 years ago. Now, the only habitable place left on Earth is Melbourne, Australia, and it’s not exactly in the best of shape either. Controlled by the Hylax Corporation, run by CEO Wolram Deaps, the city is rundown, overcrowded, and living in constant fear of the current threat: Deviants. The story follows several characters, most of whom are part of a group called Seekers. It’s their job to round up these Deviants and take them to the Hospital for treatment—which is a much more ominous fate than it sounds. Our main protagonist is Seeker Floyd Maquina, whose own wife was taken away a few years ago, sending him into a drunken spiral of self-loathing and self-destruction. The comic is done in a classic noir style, complete with the traditional, hard-boiled, first-person narration. The artwork uses digital photo manipulation to create a gritty, black-and-white look, a technique also employed in Bergen’s other gritty noir saga, Bullet Gal; however, though the style is the same, Bergen uses it to create a very different environment in TSMG. The occasional use of color and the inclusion of things like logos and advertisements help to drive home the dirty, dystopian nature of their surroundings by giving it a bit of a Blade Runner feel. Even aside from the artwork and the narration, the noir influences on both the story and the comic are readily apparent. Several classic noir films are referenced directly, including The Third Man and The Maltese Falcon, and plenty of others are subtly referenced or given homage throughout. There are also some subtle references to Bergen’s other works, for those who are familiar with them. There are brief mentions of characters and elements from Who Is Killing the Great Capes of Heropa?, Bergen’s superhero novel, released last year. And, among the collection of old magazines in an office waiting room is an issue of Bergen’s anthology comic, Tales to Admonish. These inside references are a staple of Bergen’s work. Some of them are integral to the plot, others are just for fun. Either way, though, I always enjoy looking for them. The TSMG graphic novel covers only the first third or so of the original book. There’s not a lot of actual plot yet, mainly just an introduction to the world and the characters. There’s nothing wrong with that, though, as it’s a fascinating world to explore. We break off just as the story starts to get underway. I assume that the remainder of the novel will eventually be adapted in future volumes. Until then, those of us wondering what happens next can always just read the book. Bergen’s work is always interesting and fun to read, and TSMG is no exception. Considering how much of his body of work makes reference to this world and its characters, it’s particularly interesting, finally, to see the context. If you’re a fan of gritty noir or gritty dystopian sci-fi, you’ll want to pick up Tobacco-Stained Mountain Goat. I recently received my copy of the Tobacco-Stained Mountain Goat graphic novel by Andrez Bergen (words) and Andrez and Cocoa Bergen (images) in the post, which sent me into spasms of pure joy. After reading through, I have to report that Andrez still has it ('it' being sheer talent, natch), and he has it in spades. Funded through Kickstarter, and published by the cool cats over at IF? Commix, this is a graphic adaptation of the first 90 or so pages from Andrez's novel of the same name, although it does have some extra included for all you new readers.That's right, all of you who loved the novel; Andrez has a bit of a surprise included in the new release. So don't go in thinking this is a only a blow by blow adaptation (which would be extremely awesome, in of itself), just sit back, relax, and enjoy yourself. You might be surprised by what is shown to you. Regardless, the story is still the one you know and love... and if you haven't read the novel, here's your chance to jump on board. I was absolutely blown away by this graphic adaptation, and you will be as well. I'm formally calling for a sequel, right here on this page. I NEED to KNOW what happens NEXT... I'm sure that after you read this release, you'll feel the same. TSMG is set within the last city on Earth (in this case, Melbourne, Australia), after the rest of the world has been wiped out by a global catastrophe. The hoi polloi have been saved by Hylax Industries, and especially, by it's founder Wolram Deaps. Of course, the word 'saved' can be a bit open to interpretation, sometimes. Saved, but wrapped in propaganda and the chains of control; saved, but ruled over by the whim of a fascist dictator. Saved, but forced into a rigid class system, in which people have almost no chance of bettering themselves (unless the warden finds you of use). Finally, saved, but any free-thinker, any dissident with a word to say against the status quo, is hunted down and murdered, or forcibly sequestered in hospitals, and doomed to pass from view. This is what 'saved' means, in this future world. Saved means being used, and wrapped in more and more levels of control, just in case you're needed. Until you're not (which is an event that is always held over your head), and then you're discarded like any other disposable product, tossed down the garbage chute. Quite a cheerful (and, in some ways, familiar) situation, yes? Floyd Maquina strides (okay, frequently stumbles) through this world, and he's not a man that is built along the heroic archetype; he's an everyday type of guy, that has had a great amount of tragedy pass through his life. First case in point, he wasn't able to save his wife, Veronica, from being sent to the camps (Coff! Coff! Sorry... I mean the 'hospitals'...) after she became sick. The two of them tried to hide things as best they could, but they were eventually betrayed (when you find out about the person behind this betrayal, you get to experience the meaning of REVELATION, and PLOT TWIST), and she was carted off to the camps (sorry, once again, I mean hospitals). Floyd isn't a bad guy, he's just been ground down by the wheel of fate, driven to the point that liquor and other illicit substances are all that keep him going. After his wife is hospitalized, Floyd is approached by government agents about the level of 'care' that she will receive. Since all options are extremely expensive, he is forced to join the ultra-secret, government run Seeker Branch to pay for her medical bills. You see, Floyd was a P.I. in his former life which has made him a useful commodity, as far as Seeker Branch is concerned. The agency is tasked with hunting down the Deviant 'menace', and bringing them back to interment, or out and out terminating them. Floyd's one of the few who refuses to use the latter option (except, possibly, once), but he's definitely in the minority. The Branch uses VR tests to keep their agents in line, and if you fail, for whatever reason... you'll be the next one labeled Deviant, and carted off to the 'hospitals'. His wife's condition is always held over his head, so he isn't quitting Seeker Branch anytime soon, unless he ends up dead...which is a good possibility in his line of work, and might actually be a bit of a relief to Floyd A human being can only take so much... Until then, at least he has met a fellow soul to share his rather complicated, crooked path, his trials and travails... Laurel Canyon, also employed by Seeker Branch, who is also carrying around quite a bit of tragic history herself. Another human being that has been ground down by the vagaries of existence that this life has inflicted on them. For the nonce, they manage to find some solace in each other's company. In a world such as this, can even this small gift remain untouched? Andrez is constantly honing both his writing, and his striking style of art. I loved the original Tobacco-Stained Mountain Goat, but seeing it in graphic form is a revelation. I have longed to see this story adapted as a graphic novel, and had quite a mental list of artists that I thought would do the story justice. As it turns out, the perfect artist for the job happens to be Andrez himself. The art is a direct slap to the head, which manages to wake you up, and gets you paying attention to the events taking place. Moody, sometimes muted and dark, they require your full attention to decipher the full meaning of the story being told. Striking and always beautiful, yet sometimes heartbreaking (when you see, vicariously, where everything turned to shite), the art plunges ahead, carrying the reader along. It flows seamlessly from moment to moment, tragedy to tragedy. In other words, a day in Floyd Maquina's life, and the window into the existence of the vast majority of the masses in this future city. Cocoa Bergen's artistic contributions are particularly poignant, and add that bit of nuance that allows the story to really wound you. If you haven't realized it yet, the artwork is highly recommended. 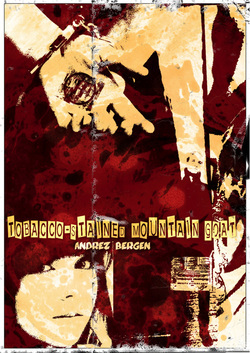 Tobacco-Stained Mountain Goat: The Graphic Novel was created by Andrez Bergen (words and images) and his daughter Cocoa Bergen (artwork). I keep saying I’m not a graphic novel sort of person, and Andrez Bergen keeps proving me wrong, damn him. Turns out I’m a complete sucker for his Bullet Gal comic series (also available at If? Commix). And so, over the Labor Day weekend, I decided to take a look at this 133-page color production with the eye-catching cover. I was hesitant—it’s based on the novel by the same name, which I possess, but haven’t gotten around to reading yet. Trust me, I’ll be fixing that oversight soon. TSMG:TGN (now there’s an acronym for the ages) has been unnervingly crafted to push all my buttons. Film Noir. Assemblage Art. Lauren Bacall references. Folks from his other novels wandering through and making themselves at home. Witty, tough dialogue. A post-apocalyptic city. Unforgettable characters. Unapologetic drinking and smoking. Floyd and Laurel’s story should be soaked up, the way a cheap paper bar coaster absorbs slopped whiskey, rather than simply read. Let the graphics seep in, let the smokey story take a long drag and blow the words into your eyeballs. Andrez counts among his visual influences, “Dada, cut-ups, Terry Gilliam, Jim Steranko, Steve Epting, Dr. Seuss and David Aja,” staying true to his eclectic, magpie-collector, culture-twister nature. Just when you’ve acclimated to one startling graphic, you turn the page and are spun on your head, given a new and intriguing view of what passes for reality in the last city on earth. What a cool ride, In a dark world only the strong survive but what do you do when life is actually a living death where you have only one choice and its made for you. You hold on to the unattainable only to lose it. Fantastic job, Andrez Bergen, I give it a Galo rating of 5 out of 5 fist bumps. Highly recommended.